The past year was momentous for the Diocese of Baton Rouge highlighted by a change in leadership. Bishop Michael G. Duca of the Diocese of Shreveport was installed as the sixth bishop for the Baton Rouge diocese on Aug. 24 at St. Joseph Cathedral, replacing Bishop Robert W. Muench. Bishop Muench had submitted his letter of resignation to the Vatican, as required by canon law, on his 75th birthday on Dec. 28, 2017. Prior to retirement, Bishop Muench continued a number of his initiatives including the Racial Harmony Commission co-chaired by Father Joshua Johnson, pastor at Holy Rosary Church in St. Amant, and Father Tom Clark SJ, pastor at Immaculate Conception Church in Baton Rouge. The goal of the commission was to play a part in the healing process of the capital city following racial strife stemming from the police shooting of Alton Sterling, an African-American. Father Clark was hopeful the commission was the start of the community working together. He invited folks from throughout the diocese to engage in dialogue, to listen to each other and be changed by that dialogue. “That kind of dialogue moves hearts, moves people to action,” said Father Clark. New buildings, new construction and renovations greeted parishioners at several churches throughout the year. 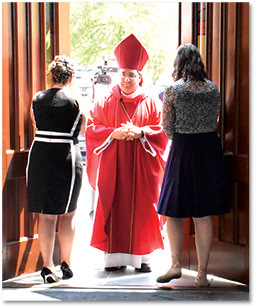 Father Randy Cuevas, pastor at St. Aloysius Church in Baton Rouge, blessed the parish’s new Pastoral Services Center. At St. Joseph Cathedral, work was completed shoring the basement and repairing the drop ceilings in the Blessed Sacrament chapel on the east side of the building and the Mary chapel on the west side. Repairs included updating the electrical wiring, which had not been updated since the 1920s, the fabrication of corrective structural beams and additional beams to allow for lights to shine on the Blessed Virgin in the Mary chapel and on the sanctuary and tabernacle in the Blessed Sacrament chapel. At Our Lady of Mercy Church in Baton Rouge, new construction and renovations changed the church and the school campus. A new 30,000 square-foot early childhood center was completed and existing classrooms were renovated to accommodate a special education program. Also, a new gym is in the works. The improvements are part of the church’s Traditions for Tomorrow campaign. Expansion is also underway for the St. Vincent de Paul Society, thanks to a $1 million grant from the city of Baton Rouge. According to executive director Michael Acaldo, the grant has helped fund a 36-bed expansion of the Bishop Ott Center and day room. The Diocese of Baton Rouge stepped into the future to preserve the past with the dedication of a new archives building that will house records reaching back some 300 years. Bishop Muench on July 26 blessed the 8,000-square foot building located on the rear of the Catholic Life Center campus. Renovations were made at Mater Dolorosa School in Independence during the summer, featuring gorgeous murals of saints and the Blessed Mother on the walls and ceilings of each classroom. Artist R.C. Davis worked 12 hours a day for several weeks in order to complete the work for the start of the new school year. Black Catholics founded St. Francis with the desire to worship with dignity and respect after years of facing discrimination and segregation in nearby downtown church parishes. Parishioners sat on borrowed chairs in their mostly completed church for their first Christmas Mass on Dec. 25, 1918. In Plattenville, an estimated 200 current and former parishioners at Assumption of the Blessed Mother Church gathered June 10 to celebrate the church’s 225th anniversary. The large turnout came as little surprise to pastor Father Joseph Vu, who said it was reflective of the deep spirituality of the people along Bayou Lafourche. Assumption was founded on April 1793, making it the oldest church along Bayou Lafourche and 11th oldest in Louisiana. In October, parishioners of St. Theresa of Avila Church in Gonzales celebrated Mass to commemorate the church’s 100th anniversary. Father Eric Gyan, pastor at St. Theresa, said St. Theresa faithfully carries out the mission Christ conferred to his disciples. St. Joseph’s Academy in Baton Rouge opened the 2018-19 school year with a year-long celebration of its 150th anniversary while the sisters of the Congregation of St. Joseph celebrated their 150th anniversary of coming to Baton Rouge to start a school and other community ministries. On May 26, Deacon John Vu took the penultimate step to priesthood when he was ordained a transitional deacon by Bishop Muench at St. Joseph Cathedral. He is scheduled to be ordained to the priesthood in May. Bishop Muench also appointed Father Matt Lorrain, pastor at St. John the Baptist Church in Brusly, as director of seminarians. Father Lorrain held that position from 2005-12. On April 6, thousands of people venerated the relics of St. Pio of Pietrelcina OFMcap at Sacred Heart of Jesus Church in Baton Rouge. The relics included St. Pio’s glove; the crusts of his wounds; cotton-gauze with</span id=”32″> his bloodstains; a lock of his hair; his mantle and his handkerchief soaked with blood just hours after he died. Throughout 2018, Catholic Charities of the Diocese of Baton Rouge continued to be active in immigration, reuniting several families from around the world and helping immigrants resettle in the Diocese of Baton Rouge. A third special session of the Louisiana Legislature proved to be the charm in securing more than $15 million in state funding for nonpublic schools, which restored funding for child nutrition services. In November, news broke that eight priests who have ministered at churches in the Diocese of Baton Rouge were among a list of 57 clergy members released by the Archdiocese of New Orleans who have been accused of sexually abusing a minor.